Ride off into the sunset with the 2020 Forest River Cedar Creek 38FBD 5th Wheel! 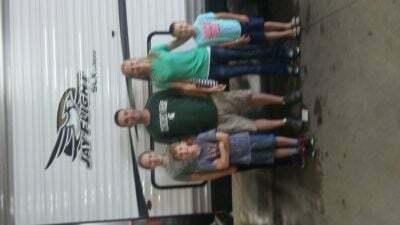 Gillettes Interstate RV is Michigan's largest, full-line RV dealer, in business for more than four decades. 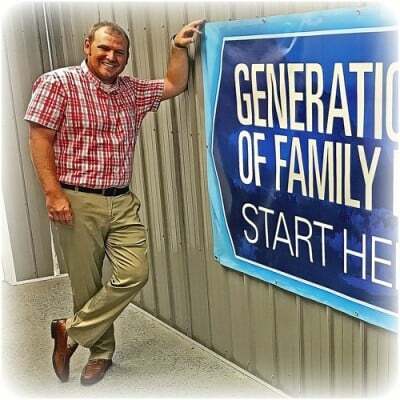 As a leader in RV sales, we've pledged ourselves to help everyone find the RV of their dreams! We do it with great customer service, a huge inventory of all the top brands, competitive wholesale pricing, and great financing! Stop in and see us today at 7210 E Saginaw St East Lansing Michigan 48823 and we'll put a smile on your face with a deal you won't believe! Don't live in East Lansing? That's no problem! We have highly satisfied customers all over Michigan and the country, thanks to our reliable 24/7, door-to-door delivery anywhere in North America! Give us a call at 517-339-8271 and visit us online today. 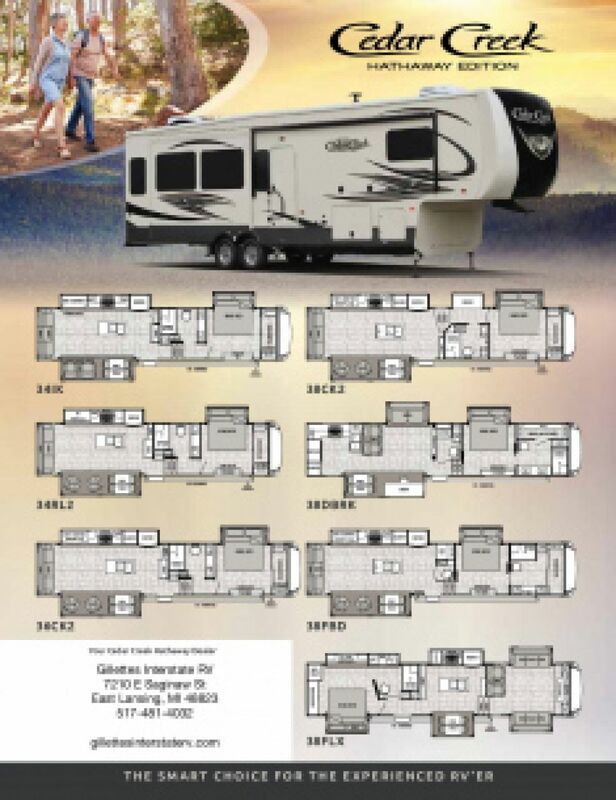 Your perfect RV is waiting for you here at Gillettes Interstate RV! Long-distance trips are no problem with this reliable RV, which boasts a hitch weight of 2295 lbs. and a GVWR of 18000 lbs. There is a 18' 0" awning that's easy to open, so you can lounge outside in the fresh air without suffering from a nasty sunburn! So many great features are included in the Forest River Cedar Creek 38FBD because it's 41' 8" long and 8' 0" wide, with 3 slides! There's plenty of living space for the whole family to relax in, and you'll stay comfortable inside no matter what the weather outside is like because this RV has a modern 15000 BTU a/c unit and a reliable 35000 BTU furnace! When you're on the road, feeding the family can be challenging. 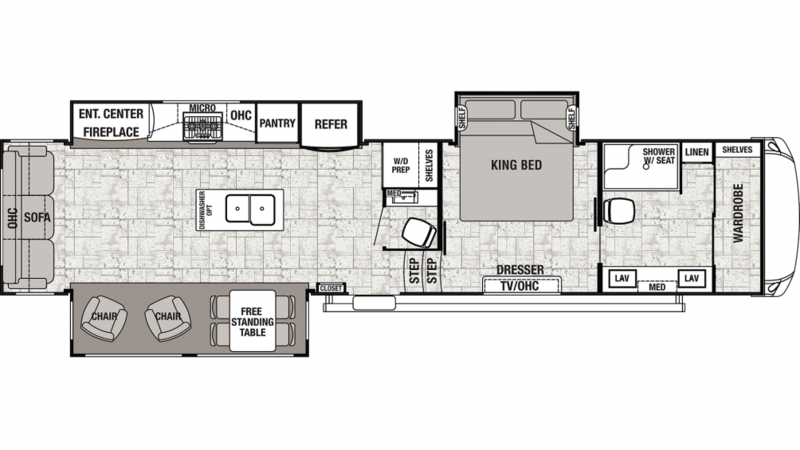 Not in the Forest River Cedar Creek 38FBD, thanks to the terrific kitchen this RV features! With all modern cooking appliances like the 3 burner range cooktop and the 18.00 cu. ft. refrigerator, you can stock all of your favorite foods and cook up delicious family meals in no time! With the 57 gallon freshwater tank, you'll never run out of the water to clean, drink, and cook with!